As an adult adoptee, I have often felt pressured to choose a side—you are either a happy adoptee or an angry adoptee. There is no in between. It can be difficult for an adoptee, especially a newbie to the adoptee/adoption community that is beginning to find his or her voice in an attempt to seek validation and community. In adoption discussions, there is often discourse because everyone thinks they have the answer—it is either black or white, right or wrong. However, what I have learned over the years from working with adoptees is that the adoptee experience is more like a Rubik’s cube; it has many positions. Not one person can tell you how to feel or tell you that you are wrong for feeling the way that you do. There is a large gray area that represents the uniqueness of each adoptees experience. 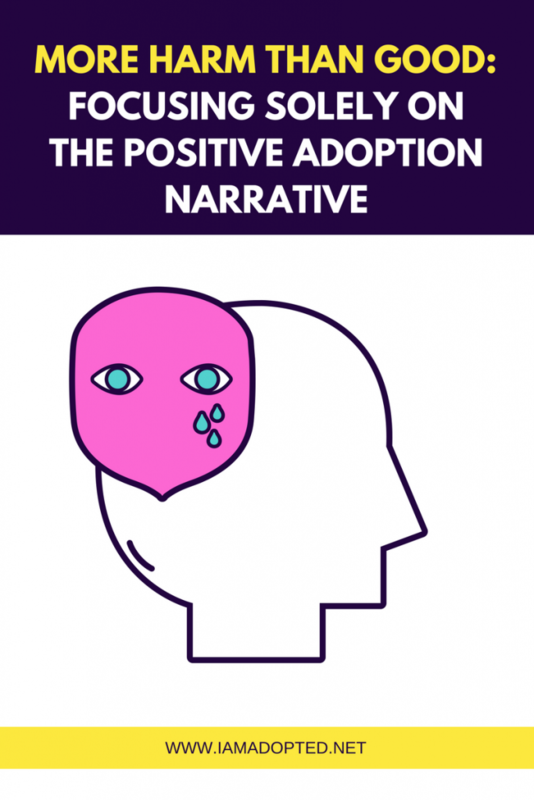 This experience can lead adoptees to have a change of position or mixed feelings about being adopted at any given time making it difficult to prove points and most importantly receive validation. There are a number factors that vary that can make adoptees adoption experience either positive or negative or both. 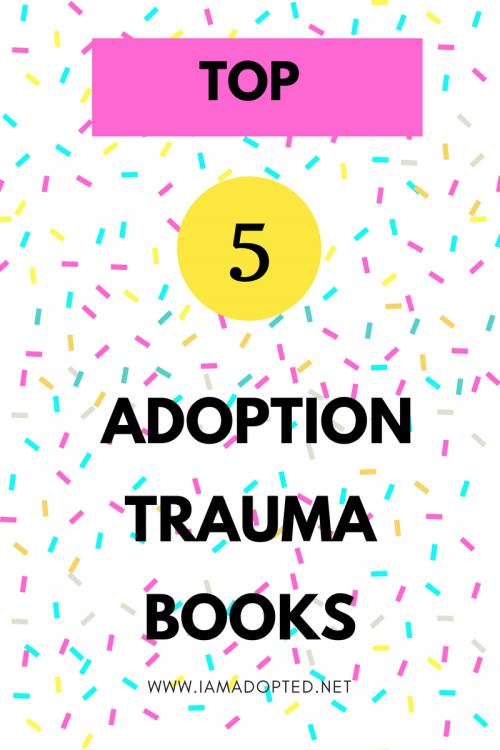 Those factors include—open adoption or closed adoption, having received counseling for adoption trauma, and how supportive an adoptee’s adoptive parents are of their child’s desires, thoughts, and feelings as an adoptee. 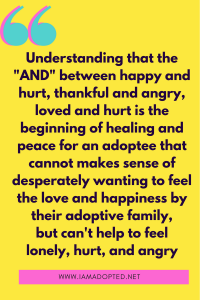 Adoptees should feel that it is okay to feel happy and hurt, thankful and angry, loved and lonely simultaneously. No one should be forced to pick a side. 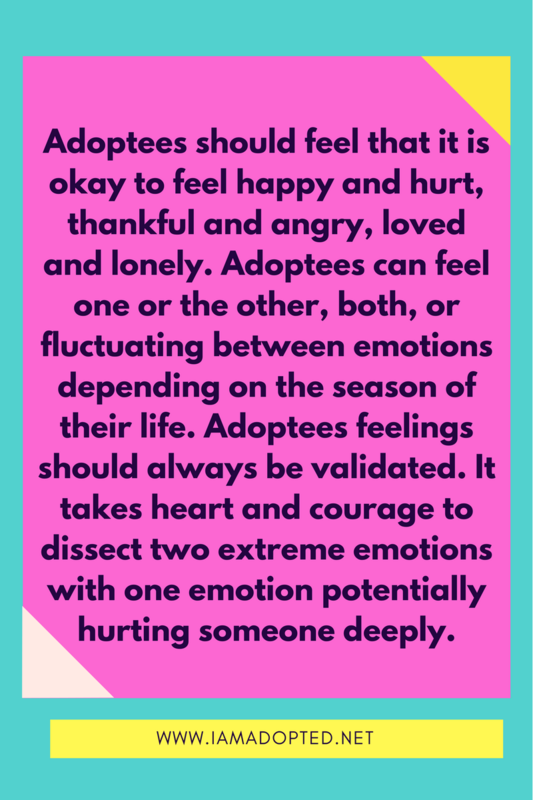 Adoptees can feel one or the other, both, or fluctuating between emotions depending on the season of their life. Adoptees emotions need to be validated the very moment they choose to speak and share. It takes heart and courage to dissect two extreme emotions with one emotion potentially hurting someone deeply. Adoptees can feel happy to be adopted and happy to have their adoptive parents in their life. Adoptees can also be happy to be out of foster care or an orphanage and no longer have to suffer from abuse or neglect and now live in a safe and loving home. However, we must never forget that despite how happy adoptees may be for all those things, they can still feel hurt that their birth mom did not raise them or could not raise them. It may hurt an adoptee whose birth mom was forced to place her child because she was deemed unfit and had to terminate her parental rights (TPR). It may hurt an adoptee to have their identity stripped from them due to closed adoption which can potentially perpetuate shame. It may hurt not to know if you will ever find your birth family or when you do, you find a gravestone. Adoptees can feel thankful for being adopted and that someone was willing to step in and care for them, love them, and raise them as their own when their birth mother could not. Adoptees may be thankful that they were removed from a dangerous situation at home and placed in a safe, loving home. However, we must never forget that adoptees can feel angry that their birth mother could not raise them. Angry that the system failed their natural mother leaving her with no choice but to place her child for adoption. Angry for the abuse and neglect endured by their natural family. Angry that they cannot articulate their feelings. Angry that they do not know their truth or identity. Furious that they were lied to about being adopted. Loved and lonely — this is a deep one because a majority of adoptees will feel this at one point in their life. 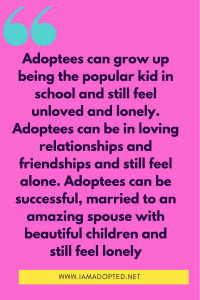 Adoptees can grow up feeling loved by their adoptive family. They can genuinely feel that they are a part of their family and treated equally to their adoptive parent’s biological children. However, no matter how hard adoptive parents strive to love their adopted child as their own, love the hurt out of them, and give them the best life possible, feelings of loneliness may still be present or resurface from time to time. The feeling of isolation is often a feeling that adoptive parents have limited knowledge of. When adoptees are raised being told over and over again how lucky and loved they are, it makes it difficult to express hurt and loss out of fear of upsetting their adoptive parents for feeling lonely, when all their adoptive parents have done was try to love them and treat them as their own. Adoptees can grow up being the popular kid in school and still feel unloved and lonely. Adoptees can be in loving relationships and friendships and still feel alone. 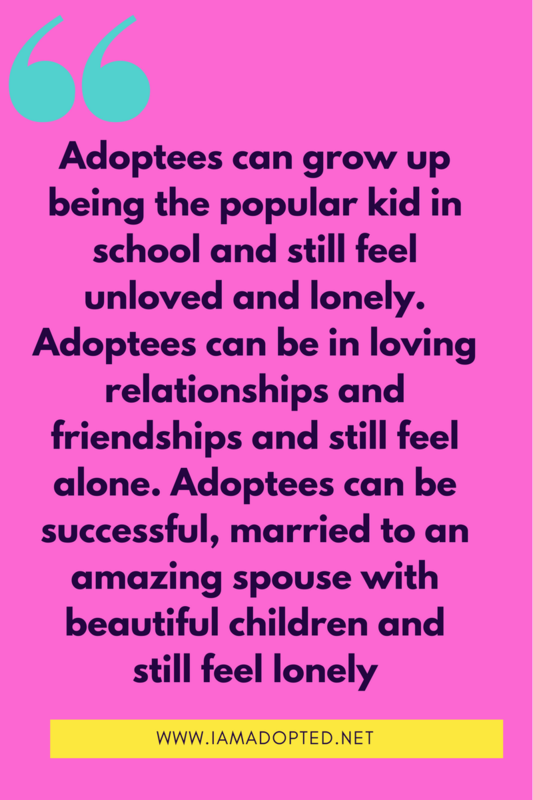 Adoptees can be successful, married to an amazing spouse with beautiful children and still feel lonely. The feelings of loneliness stem from the separation of a child and his natural mother. Adoption is not natural. A child being raised by the mother that birthed them is natural. We must remember that. What is important to note is that feelings of loneliness develop in the womb when the expectant mother is thinking about placing her child for adoption. 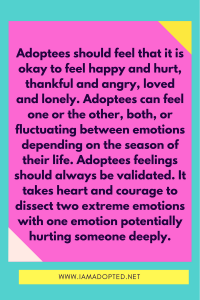 If these feelings are not explored or discussed as an adoptee grows up, it increases the odds of an adoptee growing up with feelings that they are always lonely and do not belong no matter how loved they are by their adoptive family, friends, and significant others. 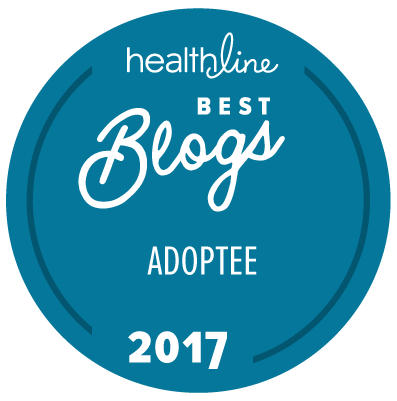 Most of us can agree that adoption is complex, particularly for the adoptee. 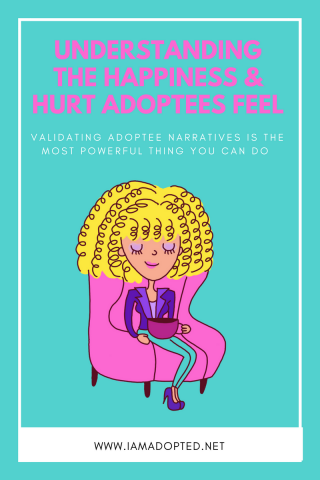 As an adoptee, I have learned that one of the hardest struggles about managing feelings is being told how to feel about being adopted—you are a happy adoptee, or you are an angry one. That seems to be the common theme the past ten years in my experience of working with adoptees. 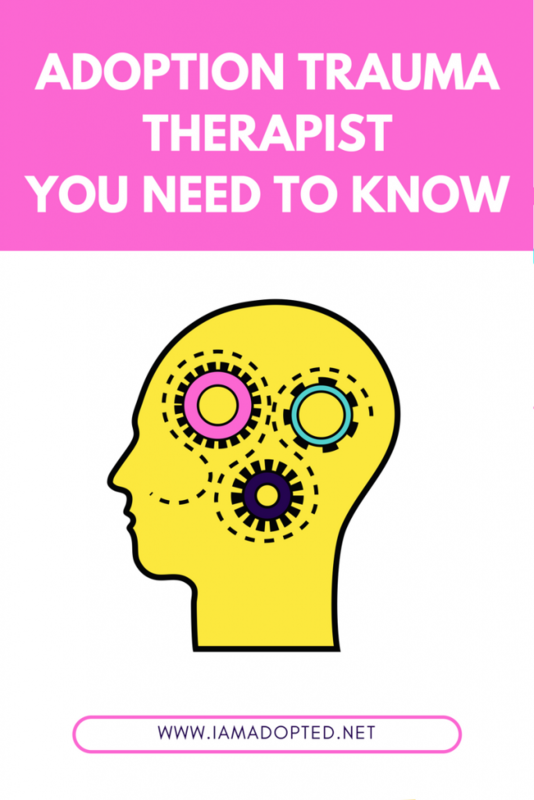 That style of thinking makes healing incredibly difficult for adoptees as they explore their feelings at different stages in their life. The culture that surrounds adoption automatically expects you to be grateful, and that is not fair. That pressure that is placed on an adoptee that is struggling with depression and trying to understand why they cannot be grateful or happy is not right. Many adoptees want to feel happy, thankful and loved. However, when the trauma and loss have never been validated or worked through, it makes it a mental struggle trying to figure out how you are surrounded by people who love you and are willing to die for you, but you still feel like you are in a world all alone. 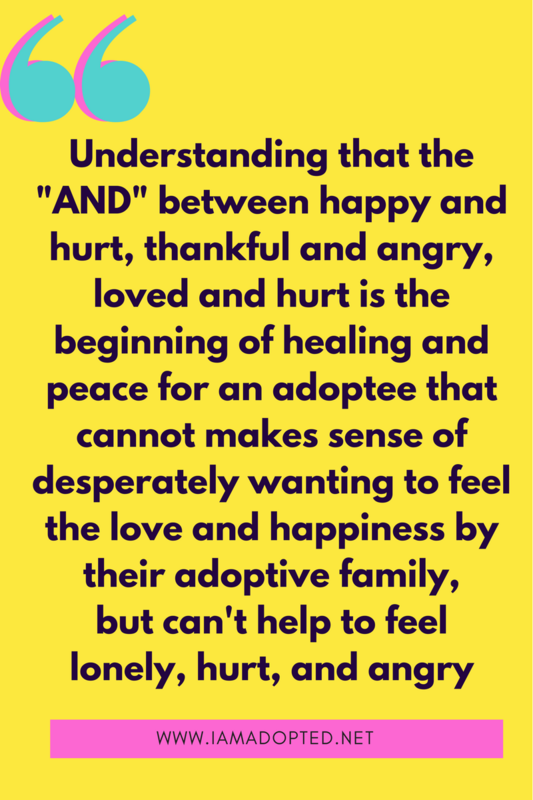 Understanding that the “and” between happy and hurt, thankful and angry, loved and hurt is the beginning of healing and peace for an adoptee that cannot makes sense of desperately wanting to feel the love and happiness by their adoptive family, but can’t help to feel lonely, hurt, and angry. Adoptees have every right to feel how they feel. What is most important is that adoptive parents honor those feelings, explore them, talk about them, and validate them. What type of feelings have you experienced as an adoptee? Please post your answers below. Before you go, I would be so grateful if you would consider scrolling to the top left of this post and ‘sharing’ this post by clicking share, tweet, or pin. Hello- My name is Laraine Francone Pipoly. I am 73 years old . BOY, DO I HAVE A STORY TO TELL! I think I could motivate a lot of people to follow their dream of finding their birth family. I had a Political Consulting firm for over 25 years . I retired 2 years ago after the death of my husband Keith from Pancreatic Cancer. Do you have Adoption Conferences? I won’t go into the whole story in this e-mail. The highlights are that my Birth Mother had Mental Illness and was in Patton State Hospital for many years. At the time of my Adoption my Adoptive Father was in and out of mental hospitals. I found my Birth Mother’s family in about 2 weeks by myself 35 years ago . My Birth Mother was already deceased. Fast forward to a few months ago when my Daughter found my 1/2 Brother who is 81 years old . Neither of us knew the other existed. My Daughter and Granddaughter flew with me to Phoenix to meet with my new family and to spend my 73rd Birthday with my Brother. We both celebrated our Birthdays together for the first time in our lives. Thank God for 23 & Me How we got to that point is a long and interesting story with a lot of grief and happiness. Everyone who hears the story can’t believe it. Please let me know if I can be of any service. I live in Long Beach, California 562-429-5144. I have a large backyard where we could hold a meeting. You’re on top of the game. Thanks for shgnari. I too have a story, having been a single child all of my life, this year I receive a telephone call from a gentleman who stated he is my 1/2 brother , come to find out we where born the same year 3 months apart, same father different mothers, grew up in the same town just miles apart, he was adopted at birth, I wish my father would have said something but never did, now he has pasted and I wish so he could have met his son, I did go this year back to my home town to meet my new brother, what a reunion, it was fantastic, he not only looked like our father but the mannerism was so familiar. since the reunion we have spoke through out each week, he always worried about rejection since he also has 3 other siblings he has since found (from his mothers side) who live in the same town , but he states they have rejected him, I have never rejected him nor his family, always supported/listen to his concerns, I love having a brother but now there is less and less communication, contact, so now I am the one who feels rejected, I do not understand especially since he could have the best of both worlds, I do not know if I should just disappear too or continue to reach out, I do not want to be a thorn in his side for what ever reason. Any ideas, this is so new to me. Wham bam thank you, ma’am, my quetisons are answered! I write an adoptee blog about my emotional issues at https://myvulnerabilitylife.blogspot.com/. Please check it out if you can and let me know what you think! Thanks! Thank you for sharing your blog link. Will do. I am a 54 year old adoptee that has had a lifetime struggle with shame and unworthiness without the realization that it may have been caused from being relinquished as an infant by my birth Mother. There have been periods in my life that I have thought that I had transcended these feelings only to have something (especially my adopted mother) trigger my feelings of not being loved, not being good enough, not mattering …..this seems so childish when it happens. I so want to get over this once and for all. I’m a 37 year old adoptee. I recently found my birth mom through ancestry dna. It has been wonderful and hard at the same time. I was adopted at 4 days old and am part of my adoptive family body, mind and soul. That being said I have also felt a pull toward my unanswered questions. Now having found Her, and getting my answers I always wondered about, I find myself at a point of confusion and sadness. I always wanted to find “Her” and tell her how grateful I was, how much I respected her etc. All that feels amazing, I’m so grateful for the opportunity to do that. I guess I didn’t think of the “Now what”. I have 8 biological half siblings that we all just found out about. On top of that She adopted 3 more. So in a different universe I would have been the oldest of 12. I was was raised as the youngest of 2. As I write this I think, girl give yourself some breathing room! Point is I appreciate reading g comforting words that validate that it’s ok to feel all sorts of ways about this experience! I love my birth mom for making that hard decision and I love my family for Adopting me and never making me feel out of place. But also it’s ok for me to feel all sorts of great area feelings about it all. Thank you. Bless you and all who come acrossed your post. I was adopted at 21 months old, in 1961. The only frustration I have ever felt was not knowing any medical history. Otherwise, my Mom was my Mom. When I was little, we “adopted” toys, books, etc. Maybe that played a large part in my being fine with being adopted. Was my Mom perfect? Of course not! And I wasn’t perfect when it came to raising my children. however, I always knew that I was loved. I have never felt anything was missing in my life. I never had abandonment issues. Maybe I am just lucky. I lost my precious Mom in December 2015. I miss her every day.